There are a few Sun Peaks camping options for those who wish to set up a tent or park their RV or trailer at or near beautiful Sun Peaks Resort. With many very affordable Sun Peaks summer accommodation options available during this slower but equally as fun season at Canada’s 2nd largest ski resort, including our Best Sun Peaks condo, Best Sun Peaks townhouse and other lodging options, some prefer to camp at Sun Peaks, mainly because they are already traveling with their trailers and want to spend time exploring this beautiful alpine village and surrounding area. The Heffley Lake Forestry (Government of BC) campsite is located just off the main (paved) road up to Sun Peaks Resort. It is about 40k from Kamloops and 15k down the hill from the resort. There is a good gravel road leading down to the day parking/boat launch/small (very) small beach area, as well as to the 28 (19 plus 9 new spots added in 2018) site campground with another small, car-top boat launch. They provide tables at each site, there are outhouses, and the contractors do a pretty good job of maintaining the site. There is a roughly $12/night charge from May to October. Heffley Lake is the best lake in the Sun Peaks camping area for swimming (nice and clean) and boating activities like water skiing and tubing, is the home of Sun Peaks/Paddle Surfit Stand up Paddleboard lessons and rentals, and has great trout fishing, canoeing, kayaking, and nearby hiking and biking trails. There can be plenty of birds and wildlife on and along this 7 km (4.5 mile) long lake to enjoy as well. Sites are first come – first served however which makes it hard to plan, and rumor has it a number of rv’s pull in early in the season and stay for a nice, extended vacation which makes things even tougher! The entrance is just past the Hitch ‘n’ Rail family resort though (see below), where you can make reservations. Click for a map of Heffley Lake and campsite area. Just 10 minutes down the hill on beautiful Heffley Lake (so you pass it on the way up while driving the main road to Sun Peaks) is the family owned and operated, family-friendly Hitch ‘N’ Rail Resort. 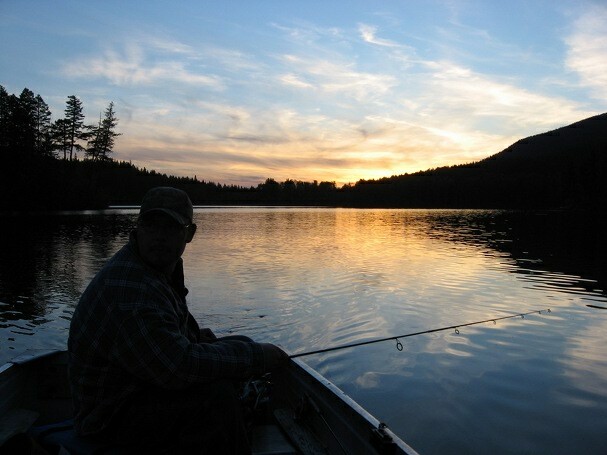 Heffley Lake is home to great trout fishing, swimming, water skiing, kayaking, canoeing, and highly recommended StandUp Paddleboard lessons, rentals and retail sales. The owners of the Hitch n Rail, Dave and Gail, along with their daughter Jessica, have ran this resort for many years and are now seeing their early guests return with their young families. They do have very strict rules for the comfort of their guests and they apparently enforce them readily. There are 4 self-contained cabins, around 18 camp sites of various sizes either lakeside or very near the lake, most have water nearby and/or power, their own sani-dump on site, as well as on-site restaurant which is open in the summer months. 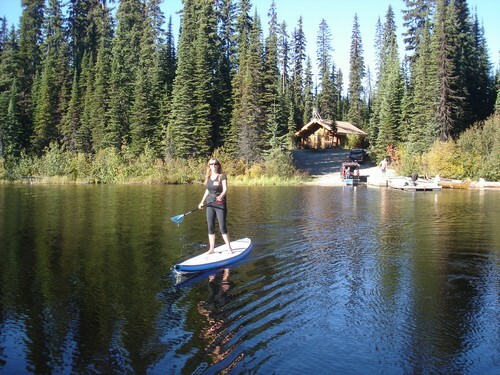 A popular destination for Sun Peaks hikers, bikers, snowshoers, Nordic skiers, trout-loving fishermen, wildlife viewers, canoers, kayakers and even us Stand Up Paddleboarders is nearby McGillivray Lake where there is a small forestry services campground with 5 free, first-come, first served sites. It is here where the Sun Peaks Voyageur Canoe tours happen, as well as the summer canoe and kayak rentals. The Sun Peaks camping sites are right across from the winter warming hut, and offer shade, picnic tables, firepits, and nearby outhouses. There is a dock there in summer which allows for car top boats to be launched, for those coming to motor around the shallow lake or to fish for trout. Wildlife can typically be seen along the way or the shoreline. To get to this free Sun Peaks camping site, stay on the main paved road and drive though the Sun Peaks Resort on Creekside Way. Turn right on Village Way and then left on Sun Peaks Road. You are now going northerly up a hill. Watch for a gravel road leading off on your right - and watch for signs. Go slow as there are some large potholes, as well as other traffic and wildlife along this 6km stretch of gravel road (click for McGillivray Lake map). Click for more information about McGillivray Lake near Sun Peaks. 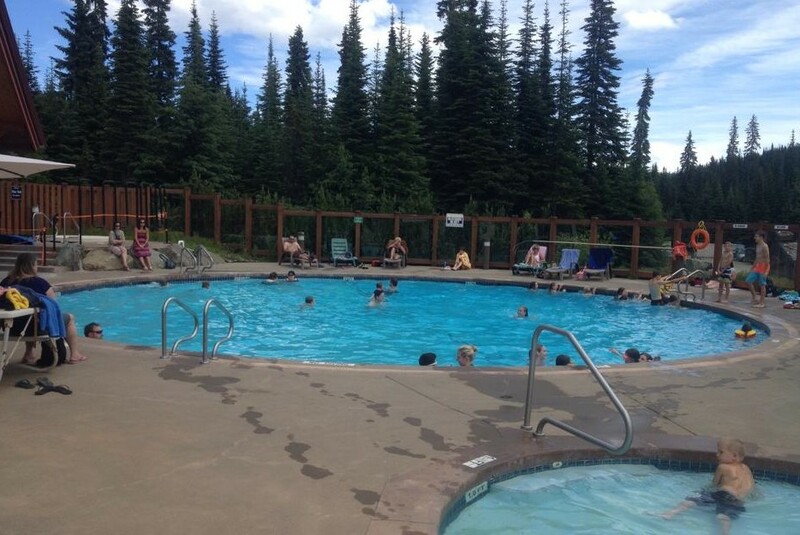 So whether you choose to stay at the many wonderfully located Sun Peaks hotels or owner vacation rental condos, townhouses and chalets, or partake in some Sun Peaks camping, head up and enjoy this wonderful family summer resort destination. 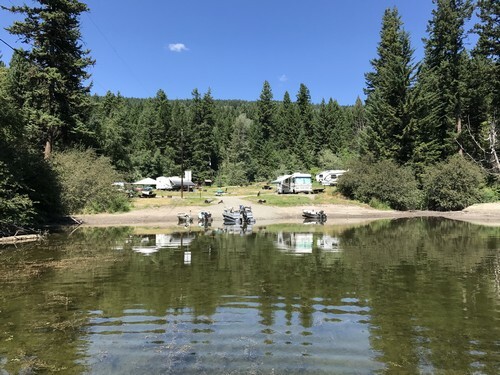 The Knouff Lake Resort is another four-season, family-friendly campground/resort for Sun Peaks camping that offers record-breaking fly fishing for Rainbow Trout and lots of other family recreational activities. This Sun Peaks area campground offers a selection of cabins, modern washrooms and showers, large campgrounds, year-round RV Sites, and boating facilities including a launching ramp and boat rentals, laundry facilities, an ‘unusual’ wood lodge/store, and a sani-dump. Pretty much everything you need for a nice camping visit while still being about 20-30 minutes away from Sun Peaks. While they do have a website, they insist on making all reservations by phone so keep that in mind when trying to book. As you are driving up the hill towards Sun Peaks Resort, travel around 8 km (5 miles) east on the Heffley-Louis Creek Road to the top of the hill and then turn left onto Knouff Lake Road at the signs. Travel north 12 km (8 miles) along a smooth but gravel road where you will come to the Knouff Lake townsite. Continue north on the west side of Knouff Lake until you arrive at the resort on the north side of the lake. Note - the gates are locked at 10 pm and don’t open again until 8 am. No matter where you camp or stay, have a BestSunPeaks vacation!